Sales as a Service has two distinct sales teams and two distinctly different sales. When you sell "sales as a service" your corporate goals are to bring in media clients that you represent and sell for. As the business owner for our call center, I worked with corporate sales to bring in new media clients and managed our recruitment ad sales team who sold on behalf of those clients. This was a turnkey recruitment advertising solution. The software company where I worked licensed the software to media companies, my team then sold recruitment listings to employers and recruiters on behalf of those clients. We were an ad agency for the software clients. Working with our corporate sales team I was able to successfully double the number of corporate clients in one year and increase revenues from sales by more than 200% in 15 months. My first goal when taking over this division was to provide corporate sales with collateral and a sales deck that accurately reflected what services my division provided. We had a few highly successful clients before I took over and we were able to pull from that success to create the necessary messaging and metrics to promote new sales and to measure the success of existing clients. My second, no less urgent goal, was to refocus the media ad sales team on high margin sales. The hourly sales team costs were well over the revenue being generated because they would sell the easy (no margin) single postings, instead of focusing on the corporate media packages. By changing the commission structure for the sales reps so they would be more fairly compensated for the large margin sales they changed their approach and eagerly went after the larger contracts. I had one rep increase sales for a client by more than 1,400% in a year after she learned the new approach. As the manager, I was responsible for setting the budget and the forecast for dozens of media sites. This required a market analysis of each client to determine who the competition was, how we were positioned in the market and a pricing analysis. Some markets were repriced to be more competitive. All markets had a forecast and the sales reps were responsible for managing the forecast by adding their sales into the pipeline. 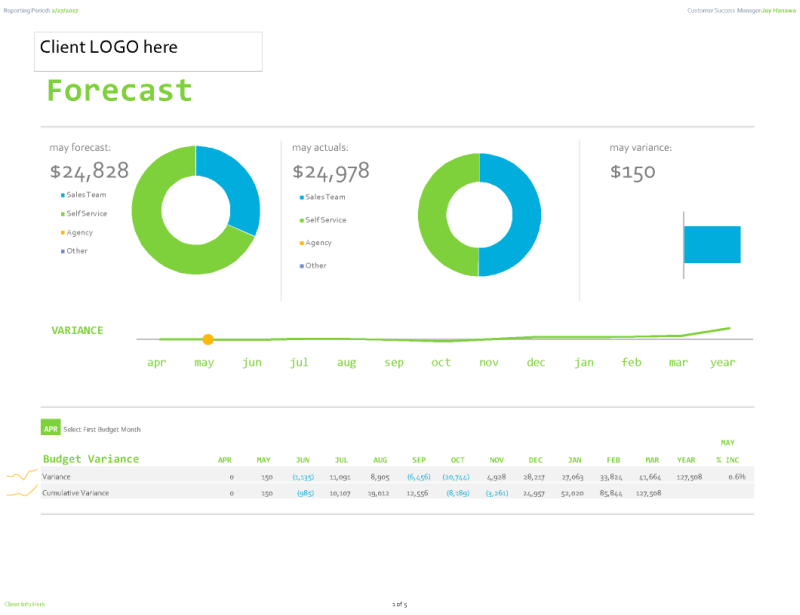 Forecasting was the most impactful change implemented as we could finally see the total market opportunity for all clients. With the forecast in hand and an understanding of overhead costs, I was able to allocate the right number of resources to each desk and project growth so we could hire and train ahead of each cycle. Online businesses have the ability for consumers to self-transact (online sales without sales assistance)... These self-service sales become the lead pipeline for the team, the challenge is ensuring the team can identify which leads to pursue. Self-service can be a very high margin way to run your sales, as long as you are not also paying a sales person to perform the same action that a consumer can do themselves. I was able to create email campaigns with promotion codes so that we could track the effectiveness of the campaigns and monitor the conversion rate by sales reps to understand where to focus the efforts. Marketing and automation, as well as traffic and distribution, are all important in supporting and feeding your trained sales team qualified leads. A well-designed media kit compliments not competes with your sales team. By reviewing online sales patterns I was able to determine specific price breaks where a sales person would be essential to building the business. I created media kits that promoted self-service for products up to $## and then created strong CALL TO ACTION prompts to chat or call our reps for better deals on the bigger ticket sales. This coupled with targeted email blasts with promotion codes for large packages allowed for the media kit to compliment and enhance the efforts of the sales team. Many changes were implemented to achieve such significant growth, none of those changes could have happened without a detailed look at our key performance indicators. Sales in terms of revenue are easy to measure, but growth alone does not tell you how well you are doing overall. For that, you need to know the opportunity and then measure yourself against the opportunity. We set our goals high and hit them because we finally saw the opportunity before us.